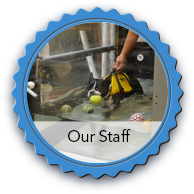 Chicago Animal Rehab is a specialty veterinary center dedicated to physical rehabilitative therapy. 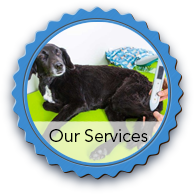 We provide traditional and complementary veterinary methods for rehabilitation, holistic healing and wellness. We are located inside Pawsitively Heaven Pet Resort. 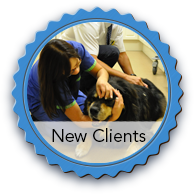 If you have any questions about how we can care for your pet, please don't hesitate to call us at (708) 576-2801. Thank you! "Indiana came to CARE when she developed a limp. 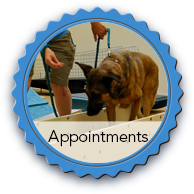 Her visits include twice-weekly underwater treadmill, once a week massage and periodic chiropractic, acupuncture, and laser therapy. We have noticed a vast improvement in her confidence going up and down stairs as well as a reduction of arthritis pain and stiffness. The staff treat her as friend, not just as a patient, and she's always excited to return. We are lucky to have such a fantastic resource in our area." "Dr. Whalen and his staff have been simply exceptional. We thought we would have to put down our aging shepherd and then found that chiropractic, acupuncture and physical therapy was all that was required. We have our boy back & he's doing great!" "After surgery, Lady went to underwater treadmill therapy twice a week. I was amazed at how she could walk so comfortably and so quickly post surgery. Lady could exercise her muscles without having to support all of her weight. Each week, she was able to go for longer distances - she is up to 20 min/session now. Lady also enjoys Mary's entertainment and jumps up and down and tries to splash all the water out of the tank - a site to see. Lady has got her life back. She was made whole again. The investment we made with Stem Cell Therapy, Surgery and post therapies(underwater treadmill and acupuncture) are worth every penny." Visiting for the first time? Click the button to fill out a form.